There are already a ton of posts out there on the rise of voice search and how its impact is being felt by every sector, particularly the Digital Marketing sector. Since integrating with smartphones, the market for smart speakers has only continued to grow – by 187% in 2018 Q2. Moreover, continuous advancements in technology are enabling us to develop even smarter speakers. Over 40 million people already use some form of virtual voice assistant. The all-knowing Google has revealed that 1 in every 5 Google searches is made using voice search, and this number is growing year on year. You don’t have to be a visionary to suggest that voice search will continue to trend and grow over the next few years – but is that really the case? The problem with all these studies into voice search is that they lack perspective. We cannot determine a genuine trend without measuring the popularity of that trend over a significant period of time. 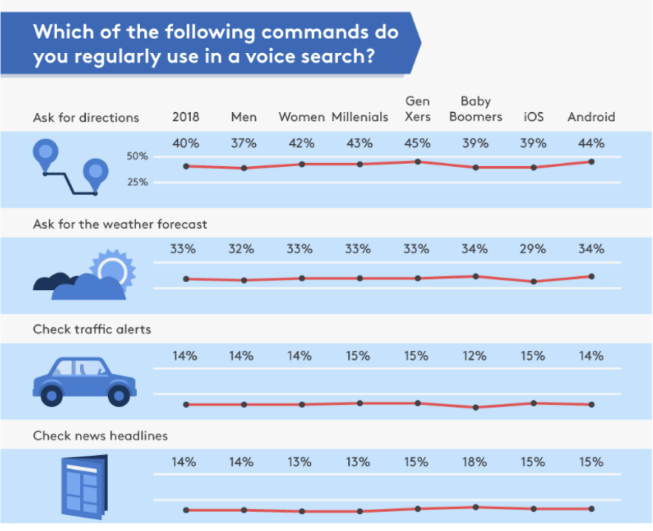 HigherVisibility recently published a study, ‘How Popular Is Voice Search?’ that did just that. They analysed the evolution of voice search from 2017 right throughout 2018 – in a bid a determine, once and for all, whether or not voice search is here to stay. How much do we really use voice search? What are we actually measuring here? Well, in this case, we’re focusing on voice assistants and smart speakers – and the very first statistic we encounter seemingly goes against popular consensus: in 2018 voice search was used less than in 2017. The percentage of people who used voice search on a phone or via a smart speaker, at least once a week, decreased from 27% to 21%, and the percentage of survey participants using voice search at least once a month decreased from 23% to 15%. 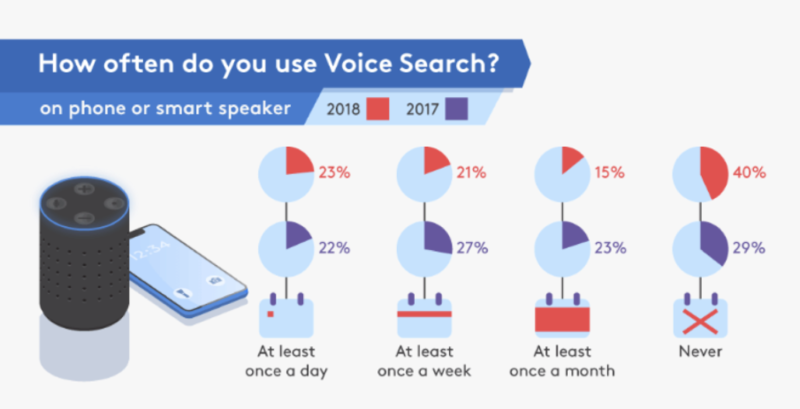 Even more noteworthy, the percentage of respondents who said that they ‘never’ used voice search increased by 11%, from 29% in 2017 to 40% in 2018. Users who used voice search at least once a day actually increased by 1% – a small glimmer of hope for smart speaker evangelists. These figures reflect a different reality from the one we’ve been fed. Voice search is no longer a novelty – the sporadic use of these devices has only decreased over the past year, and many users who were sucked in by the novelty of it all, have since abandoned voice search entirely. On the other hand, it seems that newly converted users are much more committed to voice search – actively integrating it into their day to day lives. Why are we using voice search less? To find the answer to this question, let’s focus first on how we use voice search. The most common motive behind using voice search is to find the answer to simple, basic questions – like the address of a venue, the weather, or an update on local traffic. This only confirms what we’ve already been suggesting – our relationship with smart speakers is still pretty basic. In general user expectations have cooled, but we have to keep in mind that early-adopters have incorporated voice search in their day-to-day in order to make their lives easier and more efficient. We’re not in the business of predicting the future. We have a vast skill set at Good Rebels, but psychic powers aren’t one of them (yet). 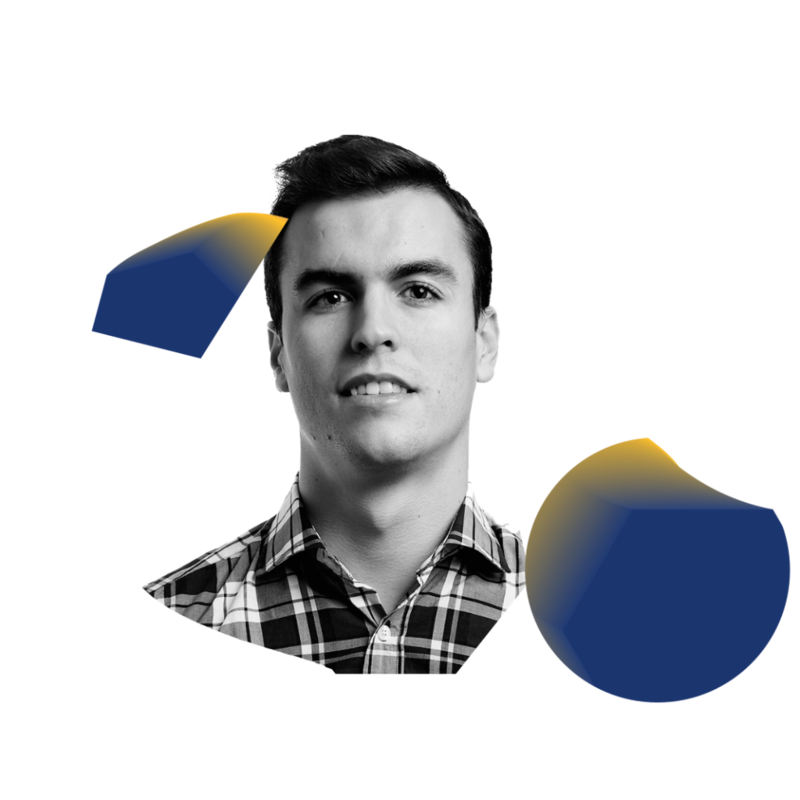 What we do know is that, as with any new technology, the rate of evolution and adoption can be slow – but eventually, change will come, and when it does we have to be prepared not only to face it, but to use it to our own advantage.